The Volkswagen Golf R is the flagship model in the firm’s most popular line of cars. Sitting above the sporty GTI and GTD derivatives launched in 2013, the new Golf R takes on those performance virtues and adds considerably more firepower to the mix. Power from the GTI’s engine has been increased by 36 percent to 296bhp. Volkswagen engineers have ensured the Golf R transmits its power to the road effectively by using an intelligent four-wheel drive system under the brand’s 4MOTION name. At lower speeds or when coasting, power is sent to the front wheels, improving fuel efficiency. As speeds increase, drive is sent to the back wheels too within fractions of a second. When necessary, almost all of the engine’s power can be sent rearwards. Using the Golf GTI’s 2.0-litre petrol engine as a starting point, Volkswagen has replaced the several of the donor motor’s parts to squeeze out 296bhp compared to the GTI’s 217bhp. Torque has increased too, nudging just over 379Nm, making this the fastest-accelerating Golf ever. When fitted with the standard six-speed manual gearbox the Golf R reaches 62mph in just 5.3 seconds, a figure which drops to 4.9 seconds when the DSG six-speed automatic is specified. Both versions are electronically capped at 155mph. Despite the potency of the performance, Volkswagen claims the Golf R won’t be visiting petrol stations too frequently suggesting the manual will return an average of 39.8mpg, the automatic slightly better at 40.9mpg. At 159g/km of CO2, the automatic should be road tax band G.
Naturally, if you’re buying a Golf R you’ll want people to know it’s more than ‘just’ a GTI. Various changes ensure the Golf R looks more muscular without being too in-your-face. Volkswagen has lowered the ride height so the R sits some 20mm lower than the regular hatchback and 5mm lower than the existing GTI. Additionally, the suspension has been modified to cope with the greater loads that will be put through it at high speeds. Adaptive Chassis Control, already available lower down the range to alter the driving characteristics will be available as an option on the R, while the steering has been substantially changed to make it react much more quickly as the wheel is turned. Visually, there’s a new front bumper with larger intakes, a new variation on the front grille design, LED day running lights and rear lamps, sporty bodykit, 18-inch unique design alloy wheels and four chrome-tipped exhaust pipes exiting the back bumper. 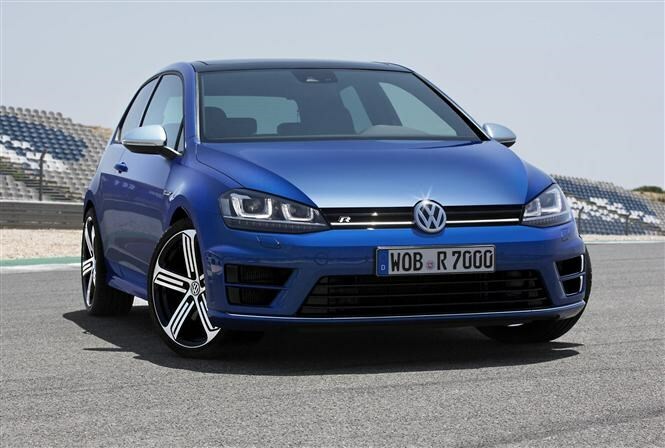 The new model reaches UK roads in late spring 2014 priced from just under £30,000 and order books are already open: check back well before then to read the full new Volkswagen Golf R review and find out how the new performance hatchback compares to stiff competition.